Could the answer to the Pacific’s water and sanitation challenges be found in nature? Today the Pacific marks World Water Day, a day designated to acknowledge and celebrate the importance of our fresh water resources. This year’s theme ‘Nature for Water,’ is an opportunity for the Pacific to explore nature-based solutions to the water and sustainable development challenges we face in the 21st century. Nature-based solutions include measures such as planting trees to replenish forests, reconnecting rivers to floodplains, restoring wetlands and utilizing natural technologies such as composting toilets. Such approaches can be a sustainable and cost-effective way to help rebalance the water cycle, mitigate the effects of climate change and improve human health and livelihoods. Nature-based solutions are already being utilized by Pacific nations such as Vanuatu, which has chosen World Water Day to launch a new management plan for its Tagabe River catchment. The catchment is Port Vila’s only source of potable water, supporting the growing needs of residents, agriculture and industry. The plan aims to protect this natural system through measures such as catchment rehabilitation and the establishment of protection zones to safeguard water quality from pollutants. The launch will be followed by active awareness-raising in the communities to ensure that current waste disposal practices show due regard for the management plan. The communities have shown respect for the progress made to date in the Tagabe River catchment and their support for the implementation of the plan is anticipated. 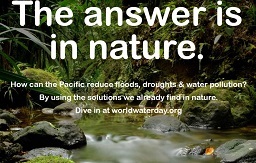 More information on World Water Day can be found at worldwaterday.org.